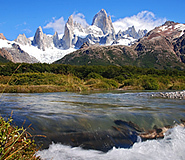 Discover Patagonia during your fully customizable Argentina vacation. All of our Argentina tours have daily departures and are covered by our price guarantee. Straddling the southern tip of the vast South American continent, Patagonia is an intriguing and legendary land of endless and rugged landscapes, remote communities, and breathtaking vistas. With a rich and often romantic heritage of ancient history, daring adventures, and desperate survival, Patagonia has assumed the status of civilization’s most isolated outpost. Yet Patagonia is a region of many faces. Its sheer size makes it a geographically and culturally diverse land that offers an almost endless array of adventures for the modern day traveler who wishes to recreate the pioneer lifestyle of years gone by, and experience firsthand what puts the “great” in the Great Outdoors. Patagonia is made for adventure, and activities range from ice trekking across glaciers to climbing the savage and world famous Mount Fitz Roy, to spending days hiking in the woods or enjoying some of the best skiing in the Western Hemisphere. Whatever thrill you seek, you are bound to find it here. Environmental extremes and almost complete isolation have left the area a largely unpopulated wilderness, making it a sanctuary for wildlife. The shores of the east coast are home to vast colonies of marine life, including whales, sea lions, and penguins, while in the Patagonian Andes, condors, huemul (a type of deer), guanaco (a close relative to the llama), and various other bird and mammal species live. Argentinean Patagonia is home to a number of towns and cities that break up the region and make it more accessible for visitors. Destinations such as El Chalten, El Calafate, or Puerto Madryn all provide a good base from which to set off on forays into the wilderness. Travel to Bariloche for an incredible skiing adventure and stop in Ushuaia to say you’ve actually been the end of the world. Travel is convenient by air, while road trips are an experience of their own. Long, sometimes unpaved routes wind and rupture through the vast plains, including Route 40, which was famously traveled by Che Guevera in his youth. 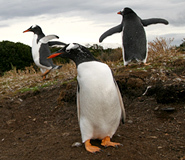 Read about top Patagonia tours and plan your exciting Argentina travel adventure. El Calafate. The town of El Calafate, toward the southern end of Argentina Patagonia, is pleasantly situated on the vast and dramatic Lake Argentina. El Calafate is ideally located for explorations into the nearby Glaciers National Park, a vast and frozen wonderland where colossal rivers of ice flow off the Southern Continental Ice Field and into the beautiful turquoise waters of Lake Argentina. 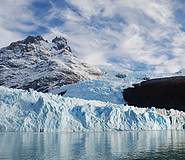 From El Calafate it is easy to take tours of the Perito Moreno Glacier and others, and enjoy the unique experience of hiking across these awe-inspiring and unimaginably huge frozen rivers. For those who prefer relaxing, a boat tour of the glaciers is highly recommended and the experience of sailing right up to the face of several stories high glaciers, and watching building size chunks of ice hitting the water below is truly a sight to behold. With the airport nearby, El Calafate is a convenient hub for forays into the wilderness, but is also a pleasant town in its own right, with shops, bars and restaurants, plus a wide range of excellent hotels. El Chalten. Wannabe adventurers visiting Argentinean Patagonia are well advised to head for the tiny town of El Chalten, a few hours bus ride from El Calafate. This is the action capital of the entire region, where hikers, climbers, mountaineers, and trekkers head to experience the unspeakable beauty of the mountainous landscapes. El Chalten is located in the shadow of the famous Mount Fitz Roy and a stunning mountain range where jagged peaks pierce the endless skies and beautiful lakes mark the end-point of winding, almost endless glaciers. It is possible to take an organized trek through the mountains, or hire equipment and go solo. The national park is very well maintained, trails are properly marked, and designated campsites are located at convenient locations around the reserve. Bariloche. The picturesque town of San Carlos de Bariloche lies further north than El Chalten, in the foothills of the Andes along the shores of the Nahuel Huapi Lake. A skier’s dream, Bariloche is within easy reach of the popular resort of Cerro Catedral, which draws skiers from all over the world to experience the tremendous slopes, excellent snow, and unbeatable après-ski. During the summer season, a tour of Bariloche is a big draw for trekkers and hikers, offering endless trails with beautiful views over snowcapped mountains and lakes. The town is known as the chocolate capital of Argentina and no trip here would be complete without a visit to one of the many fondue restaurants. Puerto Madryn. The Atlantic coast town of Puerto Madryn is a small village that has become popular thanks to its ideal location right next to the Valdez Peninsula where enormous colonies of marine wildlife live. Puerto Madryn, along with many other towns in the area, has a unique heritage. They were populated by Welsh immigrants during the 19th century and in many of the towns it is still possible to hear the Welsh language and visit a traditional tea shop. The nearby Valdez Peninsula, accessible on your Puerto Madryn tour, is marked by its vibrant coastline, stunning array of tall cliffs, rocky reefs, and exotic marine mammals. Large colonies of sea lions, Magellanic penguins, and elephant seals lay side-by-side along miles of coastal beaches, while southern right whales harbor in the gulfs. This is one of the best places for whale watching in the world. Ushuaia Tour.At the furthest southern tip of Argentine Patagonia is Ushuaia, known as the “city at the end of the world.” It is the most southern city on the planet, and the next stop down is the Antarctic. An intense adventure activity hub, the city is best known as the access point into the famous and emotive Tierra del Fuego (land of fire) which can be visited with a tour of Ushuaia. Patagonia Cruises. Starting from Ushuaia in Argentina and ending at Punta Arenas in Chile, a variety of Patagonia Cruises offer a remarkable journey through one of the planet’s last pristine wilderness areas. From the comfort of a cruise ship you are able to see the striking beauty and tempestuous grandeur of waterfalls streaking down misty mountainsides, of stone fingers thrusting into the clouds, and colossal glaciers tumbling to the sea. This is the ultimate way to view the wonders of Patagonia in the finest comfort and style. Explore the Chilean Patagonia. The activities available in the Argentine Patagonia are endless, but not all inclusive. Half of Patagonia falls inside Chilean boarders, and for a complete Patagonia experience, it is best to visit the region from both sides. While the Argentina half is best for on-land adventures such as hiking and skiing, the Chilean side offers impressive sea excursions, turquoise waters, and icy adventures. Primarily an archipelago, the best way to appreciate Patagonia in Chile is via a boat. Gazing up at jagged glaciers from sea level allows one to appreciate the real mass of these mountains of ice. South of Chile lies one of the true gems of Patagonia, the Torres del Paine National Park. Shared by both Chile and Argentina and known for its stunning landscapes of mountains, forests, glaciers, and fjords, the park is most easily accessed by the quaint towns of Punta Natales and Punta Arenas in Chile. When you should visit Patagonia depends on what you wish to do there. Many Patagonia hotels, particularly in the far south, are closed between late April and early November due to extremely low temperatures. However, this is a perfect time for skiers, and resort towns such as San Carlos de Bariloche and Ushuaia are lively during this period. Summer in Argentina generally runs from December to April. Summer is the best time to visit if you want to go exploring, camping, or trekking. If you like marine wildlife, the whale mating season lasts from September to November, which is the easiest time to spot these great creatures. Other animals, like seals and sea lions, are easy to see along coastal areas year-round. This was one memorable trip and your company made it smooth. I would have never organized a trip like that on my own! I'll definitely use your company again and recommend it to my friends. Top notch operation. I would like to thank you from the bottom of our hearts for the job well done. The trip you organized for us was wonderful, thank you ever so much. No problems, no delays, just great. All the hotels were lovely and the tours too. The Perito Moreno Glacier is just amazing and we think the highlight of the trip in Argentina. We perhaps didn't need to go to Puerto Madryn as it is very like a region we have in South Africa and very barren, but it was ok. Chile was great too. Thanks again for you help and a very fulfilling holiday. Thanks again for your great work in planning our trip. At first, we were a little wary about using an online travel agent, but we had a great experience; it never felt impersonal, which we had feared. On the contrary, the service was always very warm, responsive, and accommodating, especially compared to other agents that we had contacted. You were very flexible about our scheduling, our budget, and dietary restrictions, and there was never a problem reaching you by phone when that was more convenient. I would gladly recommend Argentina for Less to anyone traveling to that region, and would use them again myself. Thanks! Located downtown and boasting a fantastic view of the lake, the Hotel Esplendor Calafate certainly lives up to its namesake. The grand white stone building reflects the impressive snow capped mountains and glaciers that surround the Patagonian city of El Calafate. The décor aspires to Patagonian wares and is designed with the finest regional materials such as incense timbers and plaster made with native sands. The well-kept rooms are simply decorated with local materials and have comfortable beds and amenities. The restaurant serves various Argentinean dishes with locally sourced ingredients and there is a relaxing bar where you can unwind after a long day exploring the area. This rustic mountain lodge-style hotel lives up to its name, outfitted in a dark brown wood exterior and interior. Only a short walk from town, its tucked-away location and charm help you forget the hustle and bustle from downtown. Enjoy marvelous views of Lago Argentino, and let the friendly and professional staff cater to your needs as you relax. Patagonian-chic is what you'll find at the Design Suites Hotel in Bariloche. Although the interiors and exteriors of the hotel are made up of local woods and stones, there's nothing rustic about this exceptionally modern lodging. All 60 suites have floor-to-ceiling windows which provide breathtaking views of Lago Argentino. Spacious and comfortable, the suites offer internet access, a fully-equipped kitchenette and a flat-screen TV, among other amenities. The hotel itself boasts an on-site gym, heated swimming pool for dipping during the winter and an art gallery. Hotel Territorio in Punta Cuevas, Puerto Madryn, is a top-notch boutique hotel with splendid views of the Gulfo Nuevo. The hotel's prime location and opulent amenities are well complimented by the attentive, friendly staff. 36 guest rooms are carefully decorated with modern touches, and all have views of the sea, plus mini-bars, dressing rooms, TV, telephone, safe-deposit boxes, energy controls, and card key door locks. There is also a gym and spa with Jacuzzi, Scottish shower, massages, and special treatments available. The hotel's restaurant serves exquisite Patagonian cuisine and the wine cellar is well stocked with Argentina's best wines. The stylish Hotel Tolosa is ideally located a mere two blocks from the waterfront. It features comfortable guest rooms of varying sizes, including triple and quadruple rooms. Some of these rooms include hydro-massage, mini bars, and many more great amenities. Standard services include buffet breakfast, internet, and even a bicycle to take self-guided tours around the waterfront or the city. The hotel's cafeteria serves delicious light snacks, and other amenities include 24 hour room service, parking, dry cleaning and laundry, babysitting, safe-deposit boxes, and luggage storage. An intimate bed and breakfast, Hotel Macondo House, is located in a beautiful spot just a short walk from the center of Ushuaia. The interior is elegantly decorated with natural, earthy tones, and offers stunning views of the Ushuaia bay and mountains. The living room is complete with a cozy fireplace, and the hotel's seven rooms are spacious and stylishly decorated with fresh white linen and wooden flooring. Guests will without doubt enjoy the home-made Argentine breakfast, served by the friendly staff.